Cloud 9’s preeminent pilots — Steve Mayer, Jake Walker, Mike Steen and other guest instructors (depending on travel schedules) — teach brand-new pilots how to get started (and experienced pilots how to kick it up a notch). Cloud 9 supplies a kite, water helmet and harness to all students that need one. The shop carries a massive line of rental and retail gear for student use and purchase — Ozone, Cabrinha, Naish, North, Best, Crazy Fly, HQ, Liquid Force and beyond. Students must bring a wetsuit, booties, bathing suit, water, snacks and sunscreen to the lesson. Cloud 9 covers water kiting skills from top to bottom in each class. 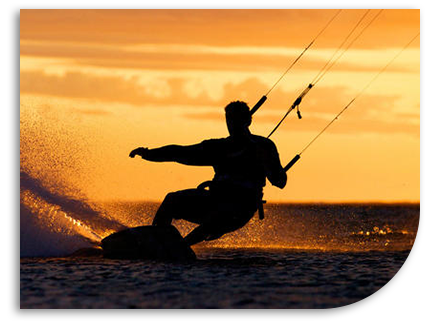 You may expect to learn kite safety, weather, emergency procedures, the wind window, body dragging, self-rescue and more. For advanced lessons, we cover jumping and stunts. Cloud 9 holds lessons at a variety of sites around beautiful Salt Lake City, UT: Deer Creek, Rush Lake, Utah Lake, Willard Bay, Yuba — you name it. The only criteria are sufficient water and wind! Generally, new students can figure out the basics of water kiting in 1-2 lessons — enough to be safe and have fun. Each half-day lesson lasts approximately 3 hours. Lessons cost $350.00 if Cloud 9 provides all gear, or $300.00 if you supply your own.